For all phlebotomy courses in programs for Medical/Clinical Laboratory Scientists, Medical Laboratory Technicians, Phlebotomists, Medical Assistants, Nurse Assistants, and Physician Assistants; and other health profession educational programs. The complete phlebotomy guide that’s ideal for both the classroom and in-practice pre-analytic reference — now updated with new safety procedures, equipment, standards, CLSI standards, and NAACLS competencies. 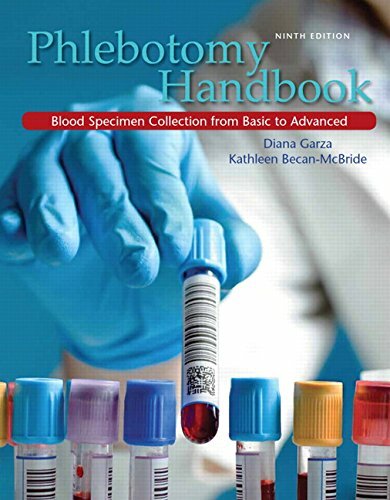 Phlebotomy Handbook, Ninth Edition links health care students and providers to the latest information, procedures, skills, standards, and equipment for safe, effective blood collection. Its contents have been selected and organized to improve diagnostic and therapeutic laboratory testing through better pre-exam blood collection knowledge, and by teaching skills that lead to better patient outcomes. Starting simple, it builds to increasingly complex competencies, covering all the crucial communication, clinical, technical, and safety skills that health care practitioners need. This edition fully reflects the latest guidelines from the Clinical and Laboratory Standards Institute (CLSI) and the National Accrediting Agency for Clinical Laboratory Sciences (NAACLS), with references to international standards as appropriate. It also reflects an even stronger focus on patient and healthcare provider safety. Also available: access to Pearson’s state-of-the-art MyHealthProfessionsLab, and a complete eText version of the book. Updated standards, procedure, techniques, and safety precautions throughout: Thoroughly reflects the latest CLSI and NAACLS standards, and the latest research, techniques, and innovations in phlebotomy and specimen collection.